Speed Stacks Pro Series 2x are designed for stackers who dream of world records! Based on our super-popular PS2 Clears, PS2x sets are printed only on the top step, resulting in a fresh, clean hand-feel with the authenticity of genuine Speed Stacks gear. PS2x cups are fully endorsed by the World Sport Stacking Association for use in WSSA competition so STACK FAST and we will see you at the next Junior Olympic Games and World Sport Stacking Championships! Developed in conjunction with the world's top stackers, they include special features and are approved by the WSSA for competition use. They also feature the patented Quick Release stem. 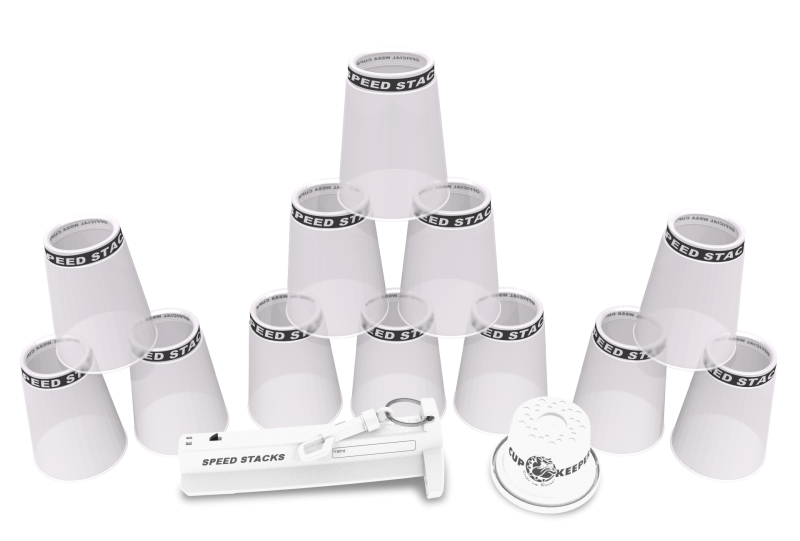 Speed Stacks® are specially designed high-tech Sport Stacking cups endorsed by the World Sport Stacking Association (WSSA) for competition. They really are great cups and I would say better than the William Polly Pro Series and overall just really great cups! I'm surprised that no one reviewed this yet. It's literally the best cups speed stacks has ever made. I like how it's clear like the William Polly Ps2. In a matter of 3 months, I was able to get ALOT of new records. It was crazy since I haven't beaten my records since the year before. It's a tad bit heavy but it's not too bad. The downstacks out of the box are horrible, but once you take maybe an hour to stack (just to break it in) it should be good to go. Overall, this is the best Speed Stacks Cups and is totally worth the extra $10! Amazing! I tried them at the World Championships and one word amazing! These Cups Are really good when broken in so do not be sad when they feel flimsy-er than WO Ps2, WP Ps2, SEK Ps2, and HJC Ps2. These cups are literally amazing! They are very light, compared to the William Orrell Pros. I was surprised by how good they were right out of the box. Sometimes, I don’t even have to try to get a good time! They are totally worth the money! I love this set! These are very smooth and great for cycle. I bought these at worlds and they are in great condition! I recommend this set. Buy it! You have to break them in. Straight out of the box the downstacks are rough. Once they were broke in they preformed amazing. Got this set at worlds and they are my favorite set that I own! I confirm that the above information is true and accurate.